Dr. Obagi’s academic commitments include serving as the director of dermatologic surgery for the residents in the department of dermatology at UPMC as well as the director of the cosmetic dermatologic surgery fellowship. In addition, Dr. Obagi trains physicians from around the world on the latest in cosmetic and laser surgery. Dr. Obagi has been quoted extensively in print publications including USA Today, Elle,Woman’s World, CNN.com, The Pittsburgh Post-Gazette and The Pittsburgh Tribune-Review. She has also appeared on ABC, KDKA-TV, WTAE-TV and WPXI-TV. She was also cited by theNew York Times Style Magazine as one of the top cosmetic surgeons in the United States. Dr. Obagi is currently the secretary of the board of the American Academy of Cosmetic Surgery. 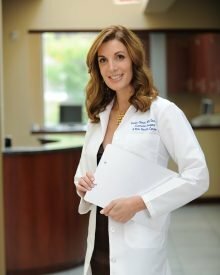 She formerly served as vice president of the American Board of Cosmetic Surgery and is a past president of the Cosmetic Surgery Foundation. Obagi S. Ten Years in Academic Dermatology. Cosmetic Dermatology Jan 2011; 24(1): 11-12. Chabra I, Obagi S. Severe Site Reaction After Injecting Hyaluronic Acid-Based Soft Tissue Filler. Cosmetic Dermatology Jan 2011; 24(1):14-21. Safo P, Whalgren C, Obagi S. Safety of Storing and Reusing Hyaluronic Acid Fillers: A Retrospective Chart Review. Cosmetic Dermatology Jan 2011; 24(1):22-26. Kranendonk S, Obagi S. An Algorithmic Approach to Hypertrophic Scars and Keloids: Maximizing Nonsurgical Options. Cosmetic Dermatology Jan 2011; 24(1):28-39. Desai N, Obagi S. Treatment of Epidermal Hamartomas: Review and Description of Treatment With Electrodessication and Combination Laser Therapy. Cosmetic Dermatology Jan 2011; 24(1): 40-47. Khetarpal S, Molenda M, Seiger E, Pui J, Obagi S. Blue Foot: A Second Case of “Tattoo Blow-Out” Pigment Spread Successfully Treated With the Qs-Nd:YAG Laser. J Drugs Dermatol 2010 Nov; 9(11):1429-31. Zhang AY, Obagi S. Diagnosis and Management of Skin Resurfacing-related Complications. Oral Maxillofac Surg Clin North Am. Feb. 2009; 21(1):1-12, v.
Obagi S. Specific Techniques for Fat Transfer. Facial Plast Surg Clin North Am. Nov. 2008; 16(4):401-7. Ciucci P, Obagi S. Rejuvenation of the Periorbital Complex with Autologous Fat Transfer. Oral Maxillofac Surg Aug. 2008; 66(8):1686-93. Molenda MA, Gehris RP, Jukic DM, Obagi S. Blue Foot: An Unusual Complication of Tattoo and Successful Treatment with a QS-Nd:YAG Laser. Dermatol Surg. Jul. 2008; 34(7):947-9. Obagi S. Guest Editorial: Time to Regain Our Credibility and to be Proactive. Cosmetic Dermatology Oct. 2007; 20(10): 624-625. Casey A, Obagi S. Vascular Malformation of the Tongue Treated with Transmucosal Nd:YAG Laser. Cosmetic Dermatology Oct. 2007; 20(10): 650-652. Paley K, Obagi S. Temporal Brow-lift With Botulinum Toxin Type A: Review of Existing Methods and Description of an Easy and Reliable Method to Achieve a Lateral Temporal Brow-lift. Cosmetic Dermatology Oct. 2007; 20(10): 655-658. Spencer L, Obagi S. Cosmetic Dermatologic Skin Care: The Essence of Our Training. Cosmetic Dermatology Oct. 2007; 20(10): 663-669. Obagi S. Autologous Fat Augmentation: A Perfect Fit in New and Emerging Technologies. Facial Plast Surg Clin North Am. 2007 May;15(2):221-8, vii. Kranendonk SK, Obagi S. Autologous Fat Transfer for Periorbital Rejuvenation: Indications, Technique, and Complications. Dermatol Surg. 2007 May;33(5):572-8. Vujevich J, Obagi S. Repair of Partial Earlobe Cleft Using a “Purse String Repair”. Dermatol Surg. 2006 Jul;32(7):969-71. Rose JG Jr, Lucarelli MJ, Lemke BN, Dortzbach RK, Boxrud CA, Obagi S, Patel S. Histologic comparison of autologous fat processing methods. Ophthal Plast Reconstr Surg. 2006 May-Jun;22(3):195-200. Obagi S. Why Does Skin Wrinkle with Age? How can you slow or prevent this process? Kranendonk SK, Ferris LK, Obagi S. Re: Botulinum toxin for the treatment of facial flushing. Dermatol Surg. 2005 Apr;31(4):491; author reply 492. Obagi S. Autologous Fat Augmentation for Addressing Facial Volume Loss. Oral and Maxillofacial Surgery Clinics of North America 17 (1), pp. 99-109. Fulchiero GJ, Parham-Vetter PC, Obagi S. Subcision and CoolTouch Non-Ablative Laser Resurfacing for the Treatment of Acne Scars: A Single Patient Split Face Trial. Dermatol Surg. 2004 Oct;30(10):1356-59; discussion 1360. Obagi, S. Correction of Surface Skin Deformities: Botox, Fillers, Lasers & Non-Laser Light Sources. Atlas Oral Maxillofac Surg Clin North Am. 2004 Sep;12(2):271-97. Obagi S, Rolewski S. Approach to the Rosacea Patient: Rethinking the Role of Tretinoin in the Management of Rosacea. Cosmetic Dermatology August 2004; 17(8): 505-511. Obagi, S. Guest Editorial: Academically Based Cosmetic Surgery. Cosmetic Dermatology June 2004; 17(6): 337-340. Obagi, Z, Obagi, S. Pearls for Successful Chemical Peeling. Cosmetic Dermatology June 2004; 17(6): 363-371. Tomar, S, Obagi, S. Autologous Fat Augmentation: Results of a Patient Satisfaction Survey. Cosmetic Dermatology June 2004; 17(6): 343-349. ObagiS. Pre- and Postlaser Skin Care. Oral and Maxillofacial Surgery Clinics of North America – May 2004; 16(2): 181-187. Obagi S. Autologous Fat Augmentation and Periorbital Laser Resurfacing Complicated by Abscess Formation. American Journal of Cosmetic Surgery 2003; 20 (3): 155-157. Obagi S. Obagi Z, Bridenstine JB. Isotretinoin Use During Chemical Skin Resurfacing: A Review of Complications. American Journal of Cosmetic Surgery 2002 Jan; 19(1): 9-13. Obagi S, Bridenstine JB. Skin Resurfacing. OMS Knowledge Update 2001. Obagi S, Bridenstine JB. Chemical Skin Resurfacing. Oral and Maxillofacial Surgery Clinics of North America. 2000 Nov;12(4): 541-553. Obagi S, Bridenstine JB. Lifetime Skin Care. Oral and Maxillofacial Surgery Clinics of North America. 2000 Nov;12(4): 531-540. Obagi ZE, Alaiti S, Obagi S, Stevens MB, Delune ME. Standardizing the evaluation of treatment outcomes after skin rejuvenation: the qualitative scoring system. Aesthetic Plast Surg. 2000 May-Jun;24(3):165-70. Obagi S, Derubertis F, Brown L, Deng JS. Hypercalcemia and parathyroid hormone related protein expression in cutaneous T-cell lymphoma. Int J Dermatol. 1999 Nov;38(11):855-62. Obagi Z, Obagi S, Alaiti S, Stevens M. TCA-Based Blue Peel: A Standardized Procedure with Depth Control. Dermatol Surg 1999 Oct;25(10):773-780. Gabbai FB, De Nicola L, Peterson OW, Obagi S, et al. Renal response to blood pressure elevation in normal and glomerulonephritic rats. J Am Soc Nephrol 1996 Dec;7(12): 2590-2599. De Nicola L, Peterson OW, Obagi S, Gabbai FB, et al. Renal functional reserve in experimental chronic glomerulonephritis. Nephrology Dialysis Transplantation 1994; 9: 1383-1389. Obagi S. Chemical Peels. Textbook- Plastic Surgery. Editor Rubin JP, Neligan P.
Obagi S. Lifetime SkinCare. Textbook- Cosmetic Facial Surgery 2nd Editor Niamtu J.
Obagi S. Chemical Peels. Textbook- Editor Niamtu J. 3) Obagi S. Proprietary Peels. Textbook- Chemical Peels 2nd edition. Editors: Rubin M, Tung R.: (2011) 109-116. 7) Obagi, S, Chaudhary-Patel M. Overview of Skin Resurfacing Modalities. Essentials in Ophthalmology: Oculoplastics and Orbit. Editors: Guthoff RF, Katowitz JA. : (2007) 259-275.